CLICK HERE FOR THE RECENT WSJ ARTICLE. Latin America has suffered more than 2,500,000 murders since the start of this century and is facing an acute public security crisis that demands urgent and innovative solutions, a new report warns. Latin America suffers 33% of the world’s homicides despite having only 8% of its population. One-quarter of all global homicides are concentrated in four countries – Brazil, Colombia, Mexico and Venezuela. Nearly one in every four murders around the world takes place in just four countries: Brazil, Venezuela, Mexico and Colombia. Last year, a record 63,808 people were murdered in Brazil. Mexico also set a record at 31,174, with murders so far this year up another 20%. The 2016 tally in China, according to the U.N.: 8,634. For the entire European Union: 5,351. The United States: 17,250. In recent years, growing numbers of families from Central America, including women and children, have fled to the U.S. because of horrific violence. Gangs such as MS-13 and Barrio 18 enforce a reign of terror, dictating even where people can go to school or get medical care. El Salvador’s murder rate of 83 per 100,000 people in 2016—the world’s highest—was nearly 17 times that of the U.S.
ACAPULCO, Mexico—It was the beginning of just another day in one of the world’s most murderous places. Cristian Sabino was sitting on a plastic chair by this beach resort’s central market when a gunman walked up and shot him five times. As the 22-year-old dropped to the ground, the assailant fired a final bullet to the head and walked away. Six more people would be killed that day in Acapulco, including a cabdriver who was hacked to pieces. Death is so much part of the landscape that once police cordoned off the area around Mr. Sabino’s body, some patrons at a nearby rotisserie chicken restaurant stayed to finish their meals. Acapulco’s days as a tourist resort with a touch of Hollywood glamour seem long ago. In a city of 800,000, 953 people were violently killed last year, more than in Italy, Spain, Switzerland, Portugal and the Netherlands put together. “The only thriving businesses around here are funeral homes,” says Laura Caballero, the head of a shopkeeper association. She closed her eight shops along the city’s main beachfront avenue three years ago due to monthly extortion demands that reached $800 per store. She says several fellow shopkeepers who refused to pay were killed. It’s not just Mexico. There is a murder crisis across much of Latin America and the Caribbean, which today is the world’s most violent region. Every day, more than 400 people are murdered there, a yearly tally of about 145,000 dead. Between 2000 and 2017, roughly 2.5 million people were murdered in Latin America and the Caribbean, as if Chicago were wiped out. That compares with about 900,000 killed in the armed conflicts of Syria, Iraq and Afghanistan combined, according to U.N. figures and estimates by groups like Iraq Body Count. During that same period, all the world’s terrorist attacks killed 243,000 people, according to the University of Maryland’s Global Terrorism Database. “Large swaths of Brazil, Colombia, El Salvador, Honduras, Mexico and Venezuela are experiencing a war in all but name,” says Robert Muggah, head of the Igarapé Institute. “WE NEED A WALL MORE THAN EVER”. BUILD THAT WALL PRESIDENT TRUMP, WE WANT WHAT HAPPENS IN LATIN AMERICA TO STAY THERE. CHICAGO, BALTIMORE AND SAINT LOUIS ARE ENOUGH. An alleged drone attack on Maduro Chauvanista of Venezuela missed their man. What a shame! But in the aftermath of the incident (click here) we can see the Tonton Macoutes running like scared dogs. Apparently they are not paid enough. This is a good sign for the opposition. President Nicolás Maduro has been elected to a second six-year term in office amid allegations by the international community and Venezuela’s opposition that the polls were neither free nor fair. His victory comes amid a deep economic crisis which has been driving hundreds of thousands of Venezuelans from the South American country. Venezuela’s oil revenues account for about 95% of its export earnings. This means that when oil prices were high, a lot of money was flowing into the coffers of the Venezuelan government. When socialist President Hugo Chávez was in power, from February 1999 until his death in March 2013, he used some of that money to finance generous social programmes to reduce inequality and poverty. Now, many of the policies introduced by Hugo Chávez also backfired. In order to make basic goods more affordable to the poor, his administration introduced price controls – capping the money people pay for such staples as flour, cooking oil and toiletries. The cult of personality has caused misery to thousands of Chavistas. Pictured here is a typical Chavista looking for a handout. Even God can’t help the common man. Another one of Obama’s friends is on the brink. Maduro is in the middle. Eight years of Barack Hussein Obama was enough – a community organizer, a deplorable president, race provocateur, divider par excellence. A destroyer of nations, a president who trashed the Constitution and at the same time started the nuclear process that obviously is intended to blow up the Middle East. Generations to come will pay for his misdeeds. Red lines were only words, treaties were to be laugh at and long time relationships dissolved like blood in water. This is the world Trump inherited. Fluidity, changing dynamics and new paradigms are the soup d’jour. But don’t despair, Team Trump is up for the job. For starters he took the bull by the horns in seeing that Neil Gorsuch became a Supreme Court justice. Rex Tillerson, the Secretary of State is no fluzzie like Hillary (jail the bird) Clinton. He does not speak softly and does carry a big stick. Our defense establishment is in good hands with James Mattis and the Attorney General is in the hands of a no nonsense player in Jeff Sessions. So look out world, the United States is on the mend; no longer seen as a patsy it was under the Obama administration. Expecting more action in the weeks to come, we wait for a new FBI director. And in the months ahead it is conceivable that a Supreme Court justice will recognize that the time has come to retire. Those who earn a living prognosticating, guessing, estimating, forecasting and contemplating what is to come are in a mercurial state. Waiting for Trump’s surprise is driving them to the next degree of insanity. Will we drop the MOAB on North Korea, what is the next step for the Boyman? And the mullahs in Iran have gone to the rug, praying to Allah for guidance. Are they to see a MOAB too? And we can never forget the tyrant in Turkey, playing both sides against the middle. Partnering with Russia and Iran against the United States and the YPG in Syria will definitely have consequences. The Kurds are our friends, Turkey’s Erdogan is a diminutive tyrant with a big ego seeking to rule the caliphate will find it time to take sides – US or Russia; you can’t have it both ways. No world view is complete without mentioning Venezuela. Soon Maduro will face the blade. Blood will spill from his neck like a chicken ready for the pot. Of course Israel is always a hot spot. Abbas, a demagogue extraordinaire, has minced worlds once again. Like Hitler negotiating with the Jews while sending then to the chambers. Abbas turns children into martyrs via the suicide bomb. We wait with patience to see how the visit with Trump works out. Netanyahu waits in the wings as it is he who determines Israel’s fate. Don’t expect him to move an inch. Land for peace never works out; give an inch and they want a yard. Gaza is the quintessential example. Netanyahu has no reservations on what will happen if a Palestinian state is to be; the next war will be fought on Jerusalem’s doorstep. North Korea, Iran, Israel, Syria and Venezuela have entered the big stage. One more provocation by the Boyman will most likely be addressed sooner rather than later. The pressure is now on China, who by the way is an existential threat to the world. The Chinese have won the checker game hands down, jumping from country to country. Spreading their web throughout the world is the main concern. However, they have been stymied at times because of their aggressive and ruthless tactics. Yes, they do bring in technology, capital and physical labor (all Chinese), but this has not sat well with the locals – fights have erupted due to their management style. The Boyman, a spoil kid indeed; what father gives a country to their first born? For the bowl hairdo is more reminiscent of a punk rocker; what’s next a Mike Tyson tattoo. Having his cake and eating it too will be short lived. As we see Venezuela crumbling quicker than the walls of Jericho, the North Koreans will soon take to the streets demanding food for their skeleton bodies. But that event will trigger the release of numerous fireworks headed toward the South. Waiting and watching demands patience, but as night follows day, patience is beginning to wear thin. Syria, the cradle of death which is basically in the eyes of many, Tombstone territory. Cadavers piling up like logs in local mortuaries. The undertaker al-Assad loves the smell of burning flesh so much he has turned his palace into a crematorium. Good for him – when the whistling missile pierces his fallout shelter he will be where he wants to be; no hearse need calling. Israel is always in the news. And why should it not be. Eight million Jews out of a world population approaching 8-9 billion, say 1/10 of 1% have caused the Middle East to go up in flames. Hey blame them for the world ills. But the real facts are completely different because those who do the blaming are fragile dictators holding on to power for they have nothing else to offer but words, death to their critics and disaster to their countries. For instance the latest jerk by the name of Erdogan, a Turkish devil of sort, Jew hater, NATO blasphemer and soon to be taken out by not the military, but by the will of the people. A similar coup d etat is waiting for him, just like the Muslim Brotherhood pimp Morsi of Egypt. Turkey by the way has unleashed bombs on the Kurds, our team does not take these killings lightly. Trump and his team are waiting for the moment to threaten the diminutive back stabber. His latest threat to Israel is a call for Muslims to visits the al-Aqasa mosque in Jerusalem. As our defense establishment processes the most recent proclamations, there can be no doubt the United States will have to choose sides. Turkey or the Kurds, it can’t be both. We go with the Kurds. By the way where is the Pope on this one. He should call for all Christians to immediately visit the Hagia Sophia. From the date of its construction in 537 AD, and until 1453, it served as an Eastern Orthodox cathedral and seat of the Patriarch of Constantinople, except between 1204 and 1261, when it was converted by the Fourth Crusaders to a Catholic cathedral under the Latin Empire. The building was later converted into an Ottoman mosque from 29 May 1453 until 1931. It was then secularized and opened as a museum on 1 February 1935. Famous in particular for its massive dome, it is considered the epitome of Byzantine architecture and is said to have “changed the history of architecture”. It remained the world’s largest cathedral for nearly a thousand years, until Seville Cathedral was completed in 1520. The current building was originally constructed as a church between 532 and 537 on the orders of the Byzantine Emperor Justinian I and was the third Church of the Holy Wisdom to occupy the site, the previous two having been destroyed by rioters. It was designed by the Greek geometers Isidore of Miletus and Anthemius of Tralles.The church was dedicated to the Wisdom of God, the Logos, the second person of the Trinity, its patronal feast taking place on 25 December, the commemoration of the birth of the incarnation of the Logos in Christ. Although sometimes referred to as Sancta Sophia (as though it were named after Sophia the Martyr), sophia being the phonetic spelling in Latin of the Greek word for wisdom, its full name in Greek is Ναὸς της ἉΑγίας τουῦ Θεού Σοφίας, Naos tēs Hagias tou Theou Sophias, “Shrine of the Holy Wisdom of God”. The church contained a large collection of relics and featured, among other things, a 15-metre (49 ft) silver iconostasis. The focal point of the Eastern Orthodox Church for nearly one thousand years, the building witnessed the excommunication of Patriarch Michael I Cerularius on the part of Humbert of Silva Candida, the papal envoy of Pope Leo IX in 1054, an act that is commonly considered the start of the East–West Schism. In 1453, Constantinople was conquered by the Ottoman Empire under Mehmed the Conqueror, who ordered this main church of Orthodox Christianity converted into a mosque. By that point, the church had fallen into a state of disrepair. Nevertheless, the Christian cathedral made a strong impression on the new Ottoman rulers and they decided to convert it into a mosque. The bells, altar, iconostasis, and sacrificial vessels and other relics were destroyed and the mosaics depicting Jesus, his Mother Mary, Christian saints and angels were also destroyed or plastered over. Islamic features—such as the mihrab, minbar, and four minarets—were added. It remained a mosque until 1931, when it was closed to the public for four years. It was re-opened in 1935 as a museum by the Republic of Turkey. Hagia Sophia was, as of 2014, the second-most visited museum in Turkey, attracting almost 3.3 million visitors annually. According to data released by the Turkish Culture and Tourism Ministry, Hagia Sophia was Turkey’s most visited tourist attraction in 2015. From its initial conversion until the construction of the nearby Sultan Ahmed Mosque (Blue Mosque of Istanbul) in 1616, it was the principal mosque of Istanbul. The Byzantine architecture of the Hagia Sophia served as inspiration for many other Ottoman mosques, such as the aforementioned mosque, the Şehzade Mosque, the Süleymaniye Mosque, the Rüstem Pasha Mosque and the Kılıç Ali Pasha Complex. Venezuela is caught in the throes of socialism’s depths, reminiscent of the Stalin era. Things are so bad that reports of cannibalism have occurred. True of not, the country is close to breaking apart; President Maduro and his provocateurs continue the Chavez revolution by the bullet. 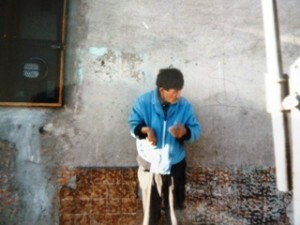 During the past week 29 protesters have died of lead poisoning, innocent victims executed in cold blood. According to Maduro and his socialist ideologues the people stand with Maduro. However, 80% or more of the people want to bring him to justice. Shortages are prevalent throughout the country due to Maduro socializing industry after industry. His iron fisted rule has caused foreign companies to head for the exists; seven hundred percent inflation is predicted this year. Note Nicolas Maduro in the background. The anti-socialist opposition in Venezuela called for daily protests following the “mother of all marches” last week, and angry Venezuelans appear to have heeded the call, defying increasingly violent repression tactics from the Bolivarian National Guard (GNB). President Nicolás Maduro has responded to the protests by attempting to return to business as usual, performing a “hip-hop” dance on national television and launching an educational initiative titled, “Urban Salsa Heart.” Maduro is the host of a weekly television show called Sundays with Maduro and the radio program Salsa Time. In central Carabobo, protesters stormed a statue of late dictator Hugo Chávez Tuesday night, burning it to a crisp. While the statue remained standing after the incident, it was significantly damaged, photos showed. CLICK HERE for the forces of evil demanding the ouster of Maduro. You might think that Madam Clinton and Sir Donald Trump have it out for each other, you ain’t seen nothing yet. Wait until the masses take to the streets and clean out the last vestiges of Chavez and his lap dog thug Maduro. Maduro by the way has carried out some of the most repressive anti-business measures in the past weeks which would make Marx and Stalin proud. Things are not well in Venezuela, businesses have shut down and the government has basically taken over (stolen) those who have not produced what the government said they should. Of course this is all non-sense because the government has pressured industry under threat of seizure to bow to the socialist regime. Why produce when you lose money on every product. These businesses had no alternative but to shut down or go out of businesses. Citizens are at wits end due to the lack of food. Protests have taken place in Venezuela after President Nicolas Maduro extended a state of emergency to combat the “foreign aggression” he blamed for the economic crisis in the country. The United States is always the bogeyman, “Yankee dogs” are always the ones at fault. Socialism is never at fault. In Venezuela, a person is murdered every 21 minutes. In the first two months of 2014, nearly 3,000 people were murdered – 10% more than in the previous year and 500% higher than when Hugo Chávez first took office. Violence has erupted pitting socialists against socialists. Looting is common. This is a country adored by Sanders, Obama and Clinton. Union thugs are manning their posts, ready at an instant to levy ISIS type destruction on their enemies; innocents will also suffer. From Chicago to Hartford to cities in between, budgets are being busted at a rapid pace. States suffering from largess include Illinois and Connecticut; sooner or later they will face the unthinkable! The “B” word. Vengeful state unions are arming their members with vitriol diatribe. When layoffs occur to the union legions violence is a given. Pensions and benefits layered on year after year are now so heavy that many states and cities cannot afford the old paradigm of tax and spend. Taxes are driving more of the productive to greener pastures thereby exacerbating the problem. Florida, Texas, South Carolina are reaping the benefits. Just yesterday it was noted that 10,000 millionaires left France for greener (means no tax) havens. Many have seen this smoldering fire burning for a while, but have ignored it; rating agencies are now lowering bond ratings of socialist city/states because of lower revenue expectations. There is only one way out of this mess, if not taken, we are looking at state and city wastelands, akin to the favelas of Brazil. At times Rio de Janeiro has utilized troops to temporarily occupy favelas such as seen here in the Complexo do Alemão during the 2008 municipal elections. This is the exception rather than the rule however, particularly with the establishment of permanent community police forces (the UPPs). Click here for the Deadly Summer awaiting Chicago. It ain’t gonna be pretty folks. “I saw a man stabbing his wife in Chicago, its my home town.” Most of those growing up want to be “killers.” Passed down from father to son. Never think that this can’t happen here; we are not an island until itself. Lying politicians using deceptive words have sucked the life blood out of cities and states with abandon; not to mention the 100 trillion dollar debt of Uncle Sam. The bottom line here, if there is one, be prepared for mass exoduses from Blue States to Red States – with Blue State implosions the military will be called in to quell the violence. Rabid dog populace will no doubt be on the lookout for red meat snatching and burning anything left in their path. The United States can print all the dollars they want, but will the rest of the world accept them? Socialist evil dwellers such as Chavez and heir Maduro promised more than they can deliver. The flames of revolution are brewing higher by the day, citizens looking for politicians blood because they have gone back on their word or stepped on too many when vaulting to the top spot. Venezuela is in the throes of an economic meltdown; peasants cooking their leather shoes, making broth laced with field grass, The Red Blooded socialist citizens are calling for Maduro’s head, Venezuela leader gets emergency powers, Chavez’s hand picked successor has continued the revolution, chasing out the capitalists, entrepreneurs, doctors and those who work for a living; with them gone the economy has gone into a tailspin, tanking deeper than Chavez’s grave. Chávez meets with Hillary Clinton at the Summit of the Americas on 19 April 2009. Venezuela has stolen the means of production, nationalizing industry after industry. Forget no inflation or slight deflation Venezuela takes the cake, 700% forecast in 2016. Murder by drug gangs, political opponents assassinated, robberies gone bad, knife attacks, what ever, the Chavista nation comes in second with 90 murders per 100,000; compare that to the U.S. with four per 100,000. 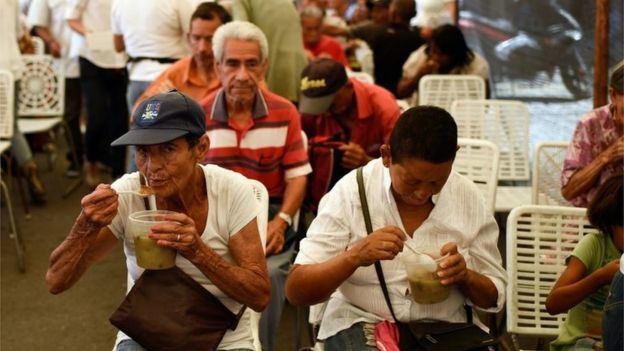 The past Chavez/Maduro voter have now reaped what they sowed, Socialism, the worst poison known to man. But please my fellow revolutionaries, don’t be alarmed at what is going down in Marti square, this is a dress rehearsal of what could happen here if the likes of Clinton seize the White House. A continuation of dollar printing will eventually break our bank too, it always does. Although blood has not flowed in Venezuela as of yet, it soon will.. The army and national guard will no doubt bring it on. After all, smash and grab (actually there is nothing to grab) so it will be smash and burn as control for for levers of power will ultimately result in guerilla warfare once again. We hope most of us will stand by and let the Venezuelans delight themselves in the game of anarchy. Do you want hard currency? Put it on the internet, pay per view, this will bring in some hard currency; wouldn’t you say. Dire straits mean dire action, we suggest they call Joe Kennedy for help, you can always count on him to return the favor. Interesting arrangement between Joe and Hugo is, well shall we say, very enlightening. From 2009. Over the past four years, Citizens Energy Corp., the signature nonprofit founded by Kennedy in 1979 as a political launching pad, has grown from a local charity serving 10,000 Massachusetts homes a year into a national effort delivering free fuel to 200,000 households in 23 states. And Kennedy, a former U.S. representative, has relied almost exclusively on Chávez, a vociferous critic of the U.S. government, for that growth. Since 2005, Citizens’ 877-JOE-4-OIL campaign has been sustained by the oil fields of Venezuela. Chávez, who controls the industry there, has delivered crude oil at no charge to a Citizens affiliate, which has resold it and used the money to pay for oil deliveries to America’s poor. In the past two years, Citizens has been given 83 million gallons of crude by Chávez and sold it for $164 million – money used to fund almost its entire philanthropic mission. Although the Chavista (may he rest in peace) is dead, he lives incarnate. His hand picked mule, Nicolas Maduro will not accept revolution’s death. Therefore, he has brought in the enforcers, the Tonton Macoutes to do what the Chavista would do, RULE BY FORCE. An old saying in Russia goes like this, the election will be held tomorrow, the results will be known today. Click here for the full article by the Financial Times. Venezuela, which holds the world’s largest oil reserves, has been hit by soaring violence, galloping inflation and food shortages under embattled president Nicolás Maduro, who leads the ruling socialist party (PSUV). Last month’s electoral defeat was the party’s worst for 17 years — or since Mr Maduro’s late predecessor Hugo Chávez launched his socialist revolution. Maduro could not accept the election result, so he is taking steps that will insure him remaining in power. We call upon Jimmie Carter to go to Venezuela and personally certify the defeat of Maduro. But don’t expect it to happen, Carter is a Chavista. Right now we are in a waiting game; on Wednesday 112 members of the opposition MUD party will be sworn in defying the court order. This will set the stage for violence. Jimmy Carter is responsible for the pullout from Iran; it was he who ignited the Iranian revolution back in 1978. Failure to back Mohammad Reza Shah Pahlavi, America’s friend in the Middle East, Carter pulled up stakes which allowed the self exiled Grand Ayatollah Ruhollah Khomeini to seize power. Prior to Khomeini’s return, mass protests erupted, many deaths resulted, shocking the country and damaged any attempt at reconciliation between the Shah and the opposition. Khomeini immediately declared that “4,000 innocent protesters were massacred by Zionists“, and gave him a pretext to reject any further compromise with the government.Add in the taking of American hostages under the watch of Jimmy Carter allowed the Iranian Mullah power grab to cement the theocratic rule by the Supreme Ruler. Additionally, the American embassy was seized and 52 hostages taken which united the country. Not until Ronald Reagan rode into office did Khomeini take heed. After 444 days the hostages were released. From then on Iran became a soviet type state in the hands of the Revolutionary Guards. Today we Barack Hussein Obama bowing to, subservient to, supporting, guiding, patronizing, cheering for and most of all lobbying for the Iranian theocracy. For the past two years the Iranians have played the North Korean card; negotiate in bad faith while developing the nuclear weapons you swear on Allah not to develop. Obama is another Jimmy Carter by allowing the Iranians to enter the nuclear club. Israel will not allow this to happen negotiations fail this is obvious; even if there is a deal only to save face. Iran will continue to centrifuge its way into the nuclear age. Don’t expect Israel to sit idly by while all this happens. Expect an Israel missile to take out Iranians capability by leveling the Arak heavy water plant and the Fordow underground uranium enrichment facility. In essence the blame will lie with Obama for increasing the possibility of a nuclear confrontation. A flashback to Jimmy Carter and the election of his friend in Venezuela, Hugo Chavez. By now everyone knows that the election which brought Chavez to a third term was a bygone conclusion – the fix was in. Jimmy Carter saw to it; with a warped mind bent on the destruction of capitalism Carter sanctioned the massive fraud. 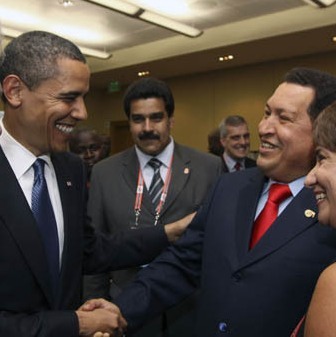 Did any freedom loving American believe that Chavez would cede power? The Carter Center, founded by former U.S. president Jimmy Carter in 1982, is a non-profit human rights organization with a self-described emphasis on âseeking to prevent and resolve conflicts, enhance freedom and democracy, and improve healthâ around the world. Founder and former President Jimmy Carter recently stated âAs a matter of fact, of the 92 elections that we’ve monitored, I would say the election process in Venezuela is the best in the world.â Hector Vanolli, director of the Carter Center in Venezuela, says that the automization (is this a word?) of every step of the process, from pre-election voter registration, to election day voting, to post ballot tallying, along with its auditability, is what sets the Venezuelan electoral system apart from other countries. As reported by independent media before the election; polls diverge widely, with some predicting a victory for Mr. Chávez and others showing a race that is too close to call, there is wide agreement that Mr. Chávez is vulnerable as never before. Handicapping the election is complicated by the angst felt by many Venezuelans that a vote for the opposition could bring retaliation. Adding to that anxiety, the government recently introduced a new electronic voting system that many Venezuelans fear might be used by the government to track those who vote against the president. Electoral officials and opposition leaders defend the integrity of the system, but there is significant distrust, and a big part of Mr. Capriles’s campaign has been to reassure voters that their votes will remain secret. When the Venezuelan tyrant Hugo Chavez passed away back in March, one notably unctuous commemorative tribute came from former U.S. President Jimmy Carter. “Although we have not agreed with all of the methods followed by his government, we have never doubted Hugo Chavez’s commitment to improving the lives of millions of his fellow countrymen,” the statement,carried on the website of the Carter Center, intoned. Carter then praised the “positive legacies” of a man famous for embracing genocidal dictators like Syria’s Bashar al-Assad and Zimbabwe’s Robert Mugabe, before ending with a vague plea to Chavez’s successors to forge a “new consensus” in taking the country forward. “Venezuela probably has the most excellent voting system that I have ever known,” Carter began, referring to the electronic voting machines that require voters to select their favored candidate on a touch screen, before collecting a paper receipt which is then deposited in a ballot box. Well, yes, we can all agree that technology is great. But it’s what you do with it that matters. CARACAS— April 2013. Ruling party candidate Nicolas Maduro narrowly won Venezuela’s presidential election on Sunday, the electoral authority said, allowing him to continue the socialist policies of the late Hugo Chavez. Chavez, who ruled for 14 years, anointed Maduro as his political heir in his last speech to the country before succumbing to cancer on March 5. That gave his former vice-president and foreign minister a huge advantage but Capriles narrowed the gap in the final days of the campaign and the result was much closer than many had expected. Actually, it was anything but. On election day, opposition monitors recorded around 6,000 violations, including red-shirted Chavista activists shepherding voters into polling booths, threats both physical and verbal against voters deemed to have opposition loyalties, and, most ludicrously, several polling stations in which Maduro’s vote was astronomically higher than that achieved by Chavez in the previous, October 2012, election, which the ruling United Socialist Party won by a comfortable margin of 11 points. Contrary to Carter’s claim, there was never a comprehensive matching of the ballot papers to the votes registered electronically. There was, earlier this month, a cursory, partial recount whose sole purpose was to validate the original announcement of a Maduro victory. There are those who will say that however outrageous Carter’s views are, they don’t really matter. In fact, they do. Much of the Carter Center’s work involves international election monitoring, since, as the Center itself says, “more governments than ever recognize democratic elections as essential to establishing their legitimate authority.”What’s therefore shocking in the Venezuelan context is that Carter, whose organization didn’t monitor the April election, has now issued Maduro with a clean bill of health. As a result, the chavistas now have even less incentive to admit observers to monitor the forthcoming municipal elections, currently scheduled for December. Given the likelihood that the opposition will attempt to turn this next contest into a referendum on Maduro’s rule, we can confidently expect a repeat of the violations of this past April. And we can be just as confident that Jimmy Carter will emerge, once the dust has settled, to assure us that the ballot was “fair,” “legitimate,” “free” and all the other words that give succor to those autocrats who decide what the result of an election will be before they hold one.